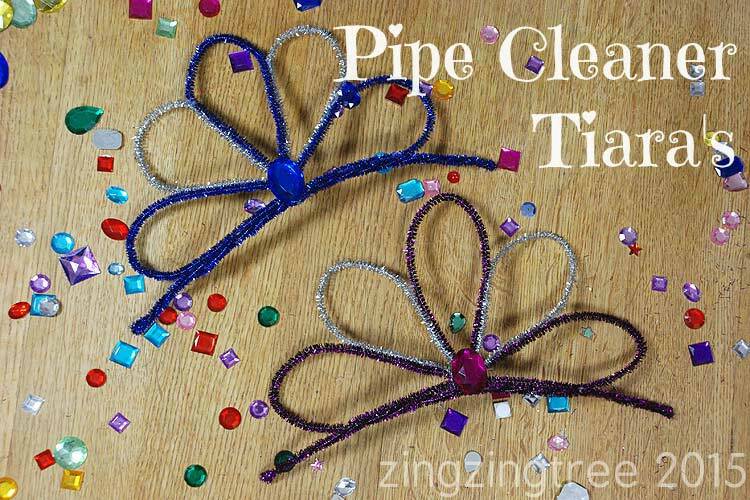 Having taken a wee break from blogging to spend time with my awesome girls I thought I’d get back into the flow of things by blogging how to make these fantastic Pipe Cleaner Tiara’s that we made to see the New Year. 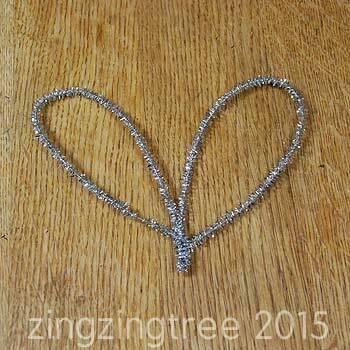 The best part is that not only are they amazing show stopper head pieces, they are super quick and easy to make. All you need are seven tinsel pipe cleaners (some of you may know them as fuzzy or glitter pipe cleaners), a hot glue gun, a large acrylic gem (or something else shiny like a large sequin) and some needle nose pliers. 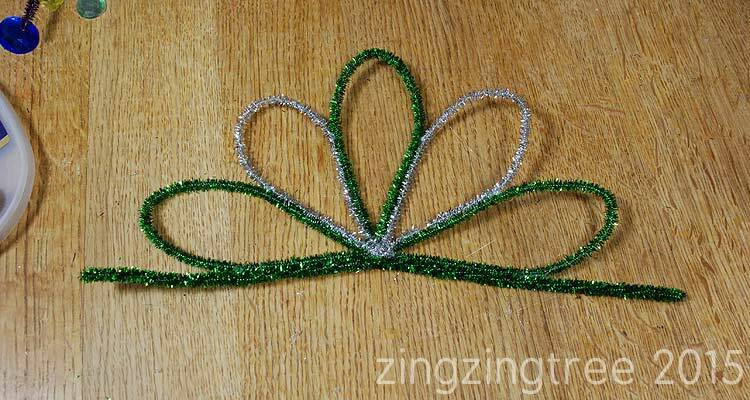 I made the petals shapes in the tiara using two different coloured pipe cleaners but you could keep it to just one colour. 1. 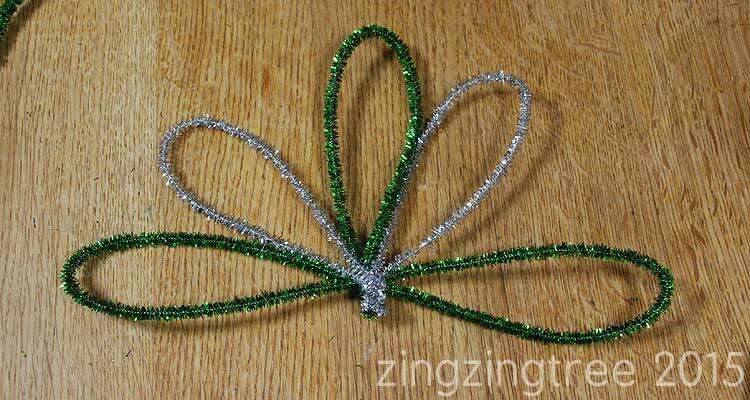 Take two pipe cleaners and twist them together to make the base of the tiara. 2. 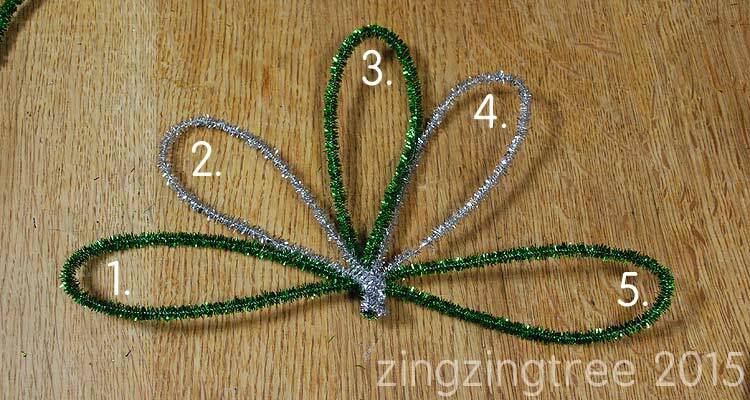 Separate the remaining pipe cleaners for the petal shapes into a group of two (petal 2 & 4) and three (petal 1, 3, 5) bearing in mind what colours you need to end up with something that looks like the image below. 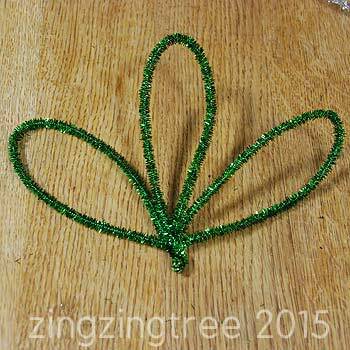 Loop each pipe cleaner in half, stack the loops on top of each other and twist the ends together. Pull the individual petal out so that you end up with the following two sets (do this even if you’re using all the same colour). 3. Squeeze the twisted ends flat with your pliers and lay them on top of each other positioning the petals so they alternate. 4. 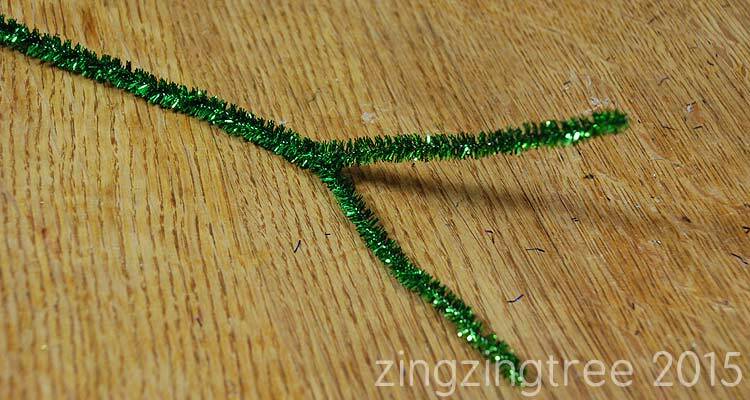 Glue the two twisted sections together with your hot glue gun and snip the ends with your pliers. 5. Next glue each petal shape to the next about three fifths of the way up and continue doing this all the way round. This is important as it will hold the shape in place and give it more strength. 8. 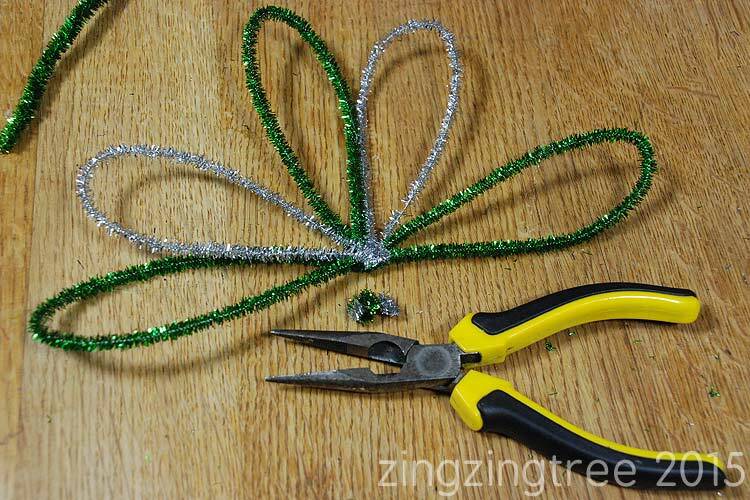 Add your sparkly gem or sequin and use kirby grips to attach it to your hair. 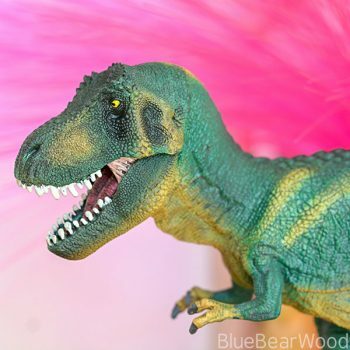 I have a five-year-old and a two-year-old who will LOVE these! These are adorable, if I had a little girl I would definitely make these. Those are adorable. Your model sure looks like she’s having fun :). oh dear, your daughter’s face is so funny! 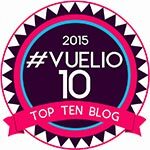 Another reluctant recruit to the world of blogging! Oh that is so clever and they look really pretty. Such a great craft idea! Fantastic, so simple and easy to do and they look stunning! Brilliant! So simple and effective! Your daughter looks beautiful, very cool and not grumpy at all – more 21st century model, lovely pic. 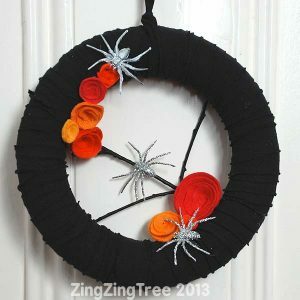 I love these, simple is best in my humble opinions, especially when it comes to kids crafts. Your daughter is beautiful too, as Chris said very 21st Century girl! 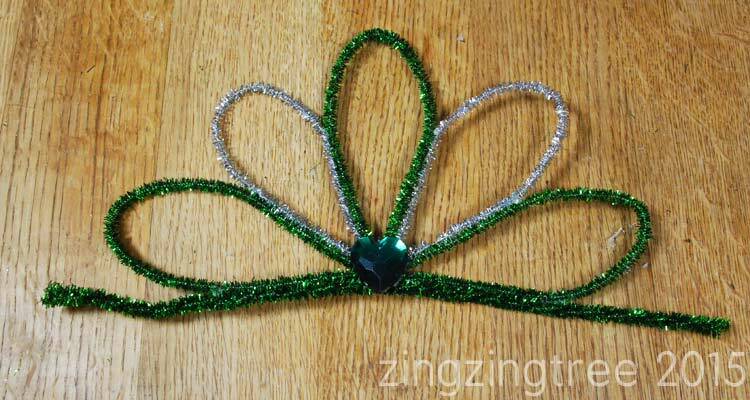 These tiaras are so cute! 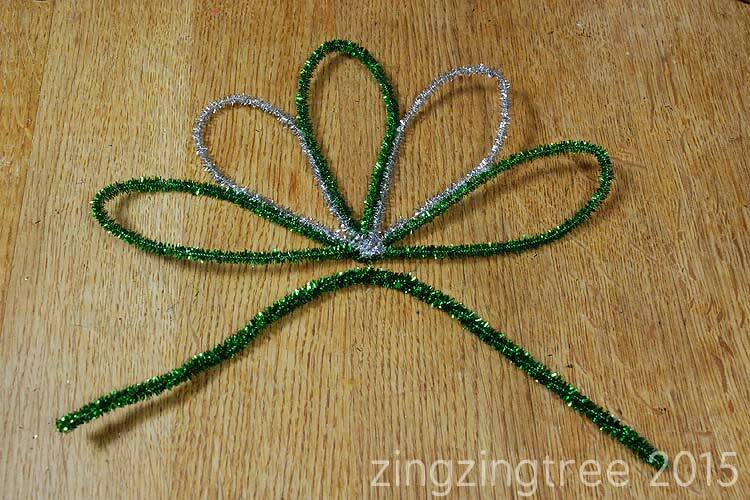 We did some fairy flower crowns not too long ago, but yours are so sparkly! 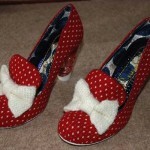 My 3 and 6 year old princesses would love these so much! Thank you for the inspiration! These are beautiful. Will try this with my girls too. Wow-my daughter would love to make one of these. What a great idea. Thanks for sharing. Oh my 5 year old daughter would love these! Great craft. An absolutely gorgeous and clever idea. 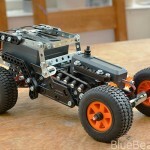 And so much cheaper and fun than buying tacky plastic ones. I love this! Looks fantastic and so easy to make. So cute! My girl will love to make these with her friends. Thank you for sharing! 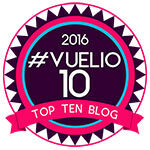 Thanks for this great idea – these are absolutely lovely! I work as a child minder and the kids I mind will love these. I already have pipe cleaners and gems galore so ready to go!